The Presidency has said that despite the Federal Government’s effort at pursuing dialogue with the Niger Delta stakeholders, militant groups have not reciprocated the government’s gesture towards finding peaceful solution to the crisis in the oil-producing areas of Nigeria. A statement issued on Wednesday quoted the Senior Special Assistant to the President on Media and Publicity, Garba Shehu, as making the observation in an interview he granted to a Kano-based radio station, Express Radio. Shehu said the continued destruction of oil installa-tions had frustrated peace talks. Shehu appealed to Niger Delta leaders to facilitate the stoppage of violence and economic sabotage in the area. “We must keep national interest above all else and give priority to eschewing violence and destruction,” he said. Shehu also said the Federal Government was facilitating development by speeding up ongoing projects and investing in construction and repair of highways, railways and electricity plants. According to the presidential spokesman, a number of projects that existed only on paper are being executed. “Kano-Katsina dual highway was awarded three years ago by the last administration. They didn’t pay a kobo for its start-up. President Buhari just paid money for the first tranche of 75 kilometres and work has begun,” he added. Shehu underscored the essence of infrastructure in the country’s economic and industrial take-off, describing it as playing the same role that the arteries play in the human body. “Without infrastructure, the country will not witness growth,” he noted. 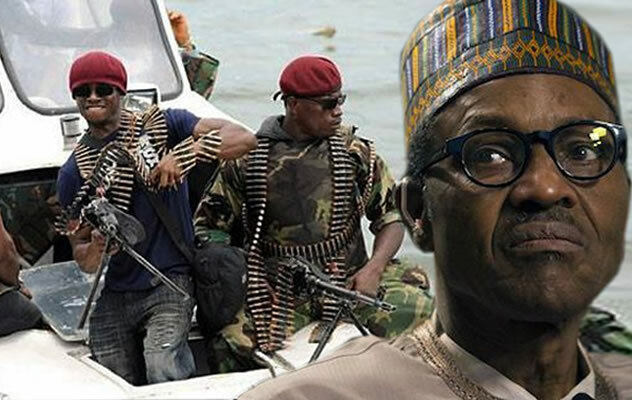 A leader of the Bakassi Strike Force, Benjamin Ene, on Wednesday indicated that moves by his group to end hostilities in the Bakassi area of the Niger Delta had been snubbed by the Federal Government. The group restated its readiness to lay down its arms and work with the Federal Government to ensure that the problems faced by the Bakassi people were addressed. Ene, also known as G1, had on November 8 returned a General Purpose Machine Gun and AK 47 rifles to the officials of the Department of State Services. He also said that his group had turned down offers by foreign and local organisations to destabilise Nigeria. In a statement made available to journalists through his counsel, Mr. Ozinko Ozinko, the militant leader, who is currently on the wanted list of Nigerian Army, said the group had over the years been sidelined in the Federal Government Amnesty Programme. He said, “As a mark of good faith and demonstration of seriousness, on November 8 by 16.30 hours, we returned weapons our fighters seized during our last confrontation. “We call on the whole world and the United Nations to note this declaration of ceasefire and the return of weapons while we remain vigilant and wait for the response of the Nigerian government. Ene said the group, which consists of over 1, 000 foot soldiers, would name its representative when the Federal Government showed seriousness and readiness to end the war in Bakassi.